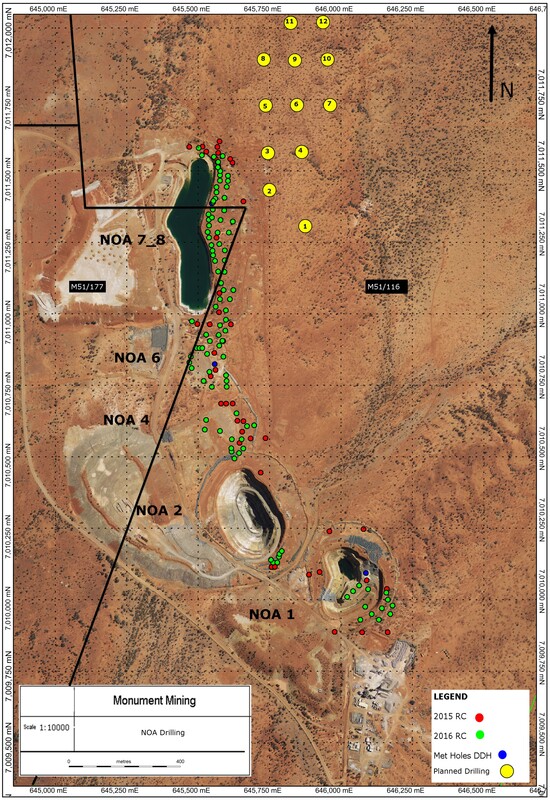 Monument Mining Limited "Monument" or the "Company" is pleased to announce a deep drilling program at the North of Alliance 7 and 8 ("NOA 7_8") deposit, Burnakura Gold Project in Western Australia (the "Deep Drilling Program"). It is aimed to test the underground potential to 500m depth in order to increase the life of mine, in conjunction with the early stage production plan. The Deep Drilling Program includes a 5,237m RC and diamond drilling programs, and has been designed and scheduled to start in October 2016. Robert Baldock, President and Chief Executive Officer, said: "There is potential to extend the high grade north plunging structures at depth at NOA 7_8. Backed by good understanding of mineralization controls, Monument will continue to explore further opportunities at depth across the Burnakura Project Area. The target is 300 to 500 meters at depth with other programs to follow, subject to results." The Burnakura Gold Project was acquired in 2014. It contained historical resource of 399,500 ounces (News Release #18-2014), of which 76,000 were from Alliance and New Alliance ("ANA"), and 124,000 ounces from NOA 7_8. Since then, the Company carried out continuous drilling programs at the Burnakura Gold Project to confirm and expand gold resources. A qualified person has not done sufficient work to classify the historical estimate as current mineral resources or mineral reserves; and the Issuer is not treating the historical estimate as current mineral resources or mineral reserves except ANA, which is a current mineral resource estimate for the deposit and it supersedes the above historical estimate. 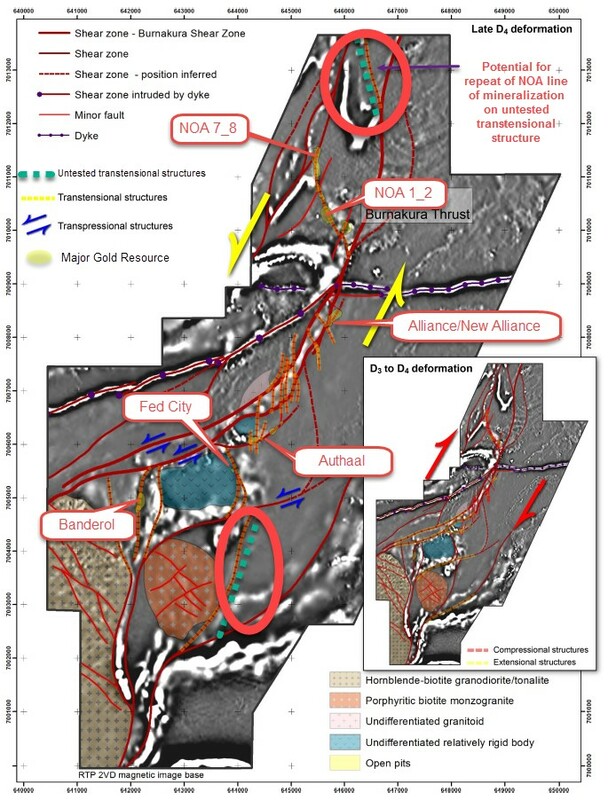 A "NI 43-101 Technical Report on the Alliance and New Alliance Gold Deposits, Burnakura, Western Australia" was filed on April 2, 2015 and amended in August 7, 2015 (prepared by Darryl Mapleson, MAIG, FAusIMM, of BM Geological Services, Cube Consulting Pty Ltd and other qualified persons). It shows an Indicated Mineral Resource of 1.88 Million Tonnes @ 1.6g/t Au for 98,400 ounces and an Inferred Mineral Resource of 100,000 tonnes @ 1.5g/t Au for 4,400 ounces using a 0.5g/t Au grade cut-off, as the current mineral resource estimate for ANA. This represents a 124% increase in the Indicated gold ounces as compared to the historical estimate inventory, as a result of improved confidence in the grade continuity of the infill and extensional drilling completed by Monument. The total contained gold ounces have increased by 35% as compared to the historical resource for the project. 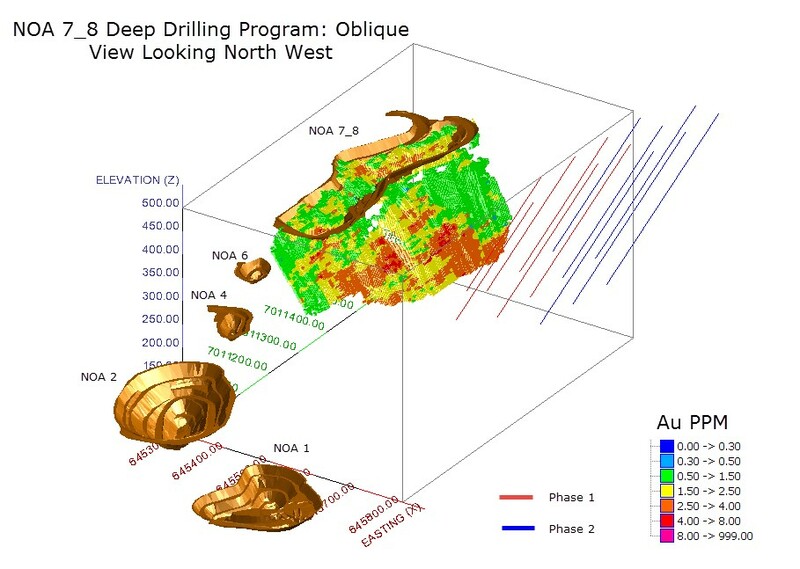 The 2016 drilling program at NOA (Figure 1) was completed in June 2016 and supports the continuity of mineralization under open pits down dip to connect infill data points for potential super pits or underground mining. Details of significant intercepts in NOA 7_8 were presented in Monument's previous News Release #15 dated July 11, 2016. 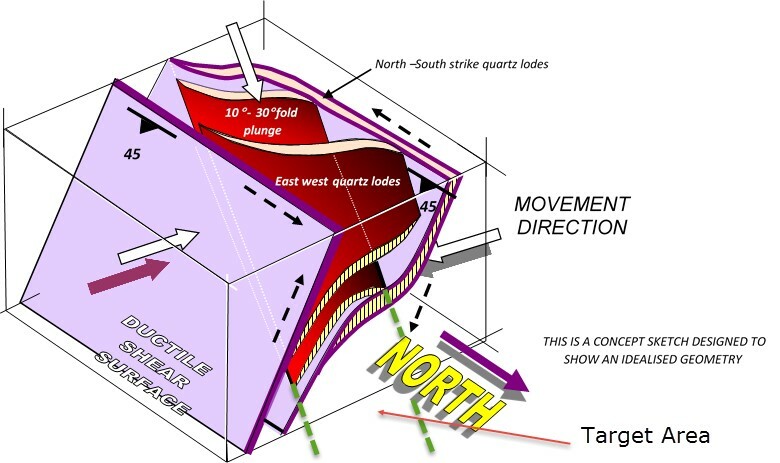 A follow up preliminary economic assessment ("PEA") study is ongoing to optimize the early stage mine plan, which will satisfy NI 43-101 definitions. Results from structural studies, historical and recent drilling to date have identified that NOA 7_8 is largely underexplored at depth. Mineralization under the current open pit is open and is prospective to be extended. deposits and planned Deep Drilling Program at NOA 7_8, please visit: http://media3.marketwire.com/docs/1065974fig1.jpg. (modified from "Structure and mineralization of the NOA 2 gold mine", prepared by Marjoribanks, R.in 2005, unpublished), please visit: http://media3.marketwire.com/docs/1065974fig2.jpg. A target area has been generated in NOA 7_8 down to a depth of 500m (Figure 3). The mineralization in NOA 7_8 has on average been drilled to a depth of 180m which is shallow compared with other more progressed mining operations in the area. 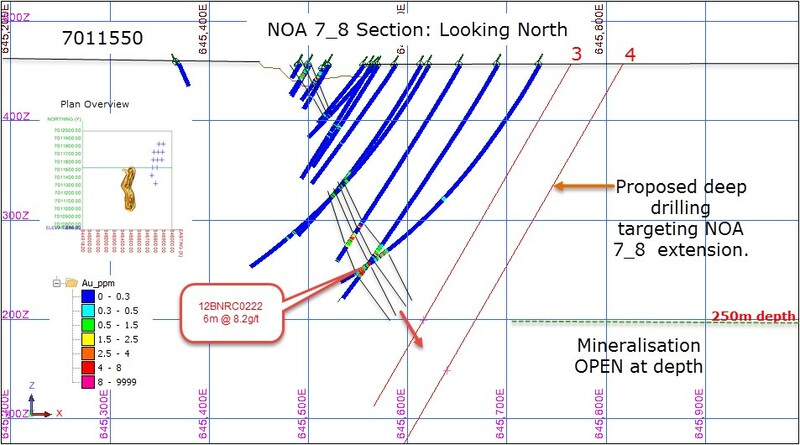 To view Figure 3 - NOA 7_8 long section, looking west, showing the planned deep holes intercepts in relation to the current internal block model and the north plunging gold high grades, please visit: http://media3.marketwire.com/docs/1065974fi3.jpg. Details of the planned 5,237m drilling program at NOA 7_8 which targets the identified plunge mineralization are shown at Table 1, detailing the collar coordinates and angles of the designed deep drilling holes, Figure 4, providing the oblique view for current in house block model and collar location of deep drilling holes, and Figure 5, giving Cross-section showing interpreted mineralization and proposed deep drilling holes. Drilling will be split into two phases. Phase 1 will extend the known information from previous drilling campaigns adjacent to the deepest completed holes, to test the north plunging extension of the identified high grade mineralization. It will comprise 6 holes totaling 2,395 m, roughly 400m average depth per drill hole (see Table 1). Holes were designed to target perpendicular to mineralization for true thickness. Phase 2 will be progressively deeper and will be reactive to results from phase 1. A nominal extension of 50 m beyond the expected intercepted mineralization is planned to account for any variation on the thickness or local structuring variation. To view Figure 4 - Oblique view for current in house block model and collar location of planned deep drilling holes for NOA 7_8, in relation to actual pits, please visit: http://media3.marketwire.com/docs/1065974fig4.jpg. To view Figure 5 - Cross-section 7011550mN (+/- 10m), showing interpreted mineralization and proposed deep drilling holes, please visit: http://media3.marketwire.com/docs/1065974fig5.jpg. Apart from direct extension of known mineralization under current mined pits, there is potential for new discoveries in the Burnakura Project Area. The area is relatively under explored. Structural analysis of the Burnakura mineral field ("Regional geophysical data interpretation and field mapping within the Burnakura and Gabanintha tenement areas, Meekatharra Goldfields, Western Australia", prepared by Crowe, W in September 2012, unpublished) has identified that all major gold resources within the Burnakura shear zone are associated with and controlled by late stage trans-tensional structures, which are mapped from magnetic imagery (see Figure 6). Several kilometer stretches of trans-tensional structures have been untested, which are prospective for further discoveries. to the main pits location, please visit: http://media3.marketwire.com/docs/1065974fig6.jpg.